바라다티주카 해변(Barra da Tijuca Beach)에 위치한 4성급 Royalty Barra Hotel은 바다 또는 산의 전망이 보이는 발코니를 갖춘 편안한 객실을 제공합니다. Royalty Barra는 에어컨이 완비된 객실과 스위트룸 이외에도 사우나, 게임 룸, 피트니스실, 놀이공간과 페드라 다 가베아(Pedra da Gávea)의 전망이 보이는 야외 수영장 등의 다양한 레저 시설을 보유하고 있습니다. 호텔은 세계 각국의 요리를 즐기실 수 있는 레스토랑, 로비 바, 수영장 바 등 3가지 식사 옵션을 제공합니다. 구내의 회의실과 비즈니스 센터도 이용하실 수 있습니다. 호텔은 바라 다 티주카(Barra da Tijuca) 지구의 Pepê Beach(페페 해변) 인근에 자리해 있으며, 도시의 가장 현대적인 상업 중심지에서 차로 5분 거리에 있습니다. 이 호텔에서는 예약자의 신용카드로만 결제하실 수 있습니다. 개보수 공사가 월요일에서 금요일까지 9:00~17:00 사이, 토요일에는 9:00~13:00 사이에 진행되오니, 참고하시기 바랍니다. 공사로 인해 다소 불편하실 수 있사오니, 양해 부탁합니다. 서로 연결된 객실은 요청 시 추가 요금으로 이용 가능합니다. Perfect breakfast! The view from the hotel room was really beautiful! It was a really nice hotel with good service.. The beach at the hotel is also nice. I was traveling alone and I felt that the atmosphere for a single man was little boring around the Hotel.. There is a few restaurang/Pubs near the hotel but I got the feeling that this is a perfect place for a couple or a family to stay.. It's not for a single hungry man..
hotel rooms max 2 stars,except the few renovated ones.had to change rooms twice and only with the help of the manager-no english- we got renovated room which was then acceptable,but max 3 stars. I had to call the house keeping to ask for new towels in every one of the three days of my staying! As I arrived late in the hotel after the shows, because of the shows, and the rates were too high, the hotel could offer an earlier and later breakfast without any extra charge! It's a good hotel with a good localization in front of the beach at Barra da Tijuca. I found the price of the meats too simple and very expensive. In geneal I recommend this hotel and I probably will come back next time in Barra. I enjoyed my stay at Royalty Barra. The staff was very caring and supportive. The most attractive part was the amazing sea-view from my room and the cool beach right across the road where I had fun with my colleagues. Breakfast was great! I was attending a conference in a nearby nice hotel but found that Royalty Barra was a still better location to stay and enjoy the Rio views ! Fast elevator,with confusing buttons. The lobby is marked with T ! Extra charges for garage that were R$ 50 per day and to use the safe R$ 5 per day. We could see the sun rising and setting from our varanda. The location was perfect. the breakfast is nice (but only served til 10am), beachfront view. Right infront of the beach. Round the corner lots of eating places and super markets. Difficult to get taxi some times. 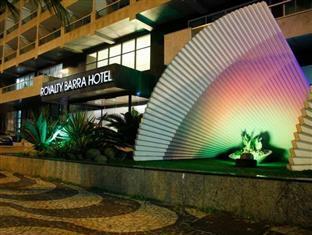 Knowing hotels in Rio de Janeiro are freaking expensive, Royalty Barra Hotel is consider good value for the money. I would stay here again if I come back to Rio de Janeiro. The hotel room was a perfect size with beautiful views off the terrace of the ocean and mountains. The breakfast was fresh and very good. Not your typical continental breakfast of cereal and bread. The breakfast had fresh fruit, a variety of Brasilian breads, eggs, quiche, cheese meat. . .Very good! No iron and no washclothes! Had to send out to get my clothes ironed, b/c no irons are allowed in the room and it was around 5,00R.for a pair of pants and when the clothes returned they still had wrinkles. I also had to use a hand towel in place of a washcloth. Overall, I give the hotel a thumbs up! I loved the location, accross from the beach and views of the beach/ocean and mountains from the terrace of the room were absolutely beautiful. The breakfast was great with a variety of fruits, cheese, meats, breads. . .etc. One negative is that you cannot even bring a cup of coffee up to the room from breakfast. There is someone who is 'standing guard' so NOTHING is removed. I was also disappointed in not having an iron in the room. After I sent out my clothes to pay to get ironed, they came back with a bill and wrinkles still on the clothes. I recommend bringing your own starch and a mini iron if you want your clothes wrinkle free. The hotel was very safe and clean. This is my first visit to Brasil and I felt very safe, even on the beach. Most of the people around the area are locals that live there and are not there to hustle you. Beautiful view. Able to experience Brazillian operated establishment. Simply appointed rooms but functional. Immaculate. Good dining room. Good customer service. Always someone in reception and dining area who could speak English. Staying at the Royalty Barra was a good choice. For the price of the rooms, the view, accommodations, cleanliness, availability of a nice dining room, we were very satisfied. The staff in the reception, dining, support services, and housekeeping areas were accommodating and made every effort to fulfill our requests. There was always someone on site that was available to speak English if the need arose. Die Aussicht, das grosszügige Zimmer. Positiv aufgefallen sind mir das grosszügige Zimmer mit grossem Balkon und wunderbarer Aussicht auf den Strand. Ansonsten stünde dem Hotel eine Renovation gut an und das Personal dürfte freundlicher sein. Waren wohl durch den nahgelegenen Kongress etwas überarbeitet. Muy buena ubicación, las instalaciones Estan en perfecto estado. La verdad es que el hotel es muy bueno. Lo recomiendo completamente. La ubicación es cómoda, esta sobre el mar, la pileta es grande y cómoda. Las habitaciones son grandes y con muy linda vista. Muy limpio, No hay nada para criticar realemente. Si vuelvo a ir a barra seguramente lo vuelva a elegir.